The entrepreneurial nature of Tatarstan’s population makes Kazan and the surrounding region a mecca for new business growth. Kazan’s IT Park provides evidence that Tatarstan’s economic engine can continue to be revved by the use of Public Private Partnerships, with numerous marketable business models being developed currently through multiple PPP mechanisms, among them the IT Park Business Incubator. Those interested in return on investment should know that, while government funding provides an important and fruitful catalyst that is at times necessary (especially when large scale investment is required), it is in fact the entrepreneurial nature of Tatarstan’s population that makes Kazan and the surrounding region a mecca for new business growth. The entrepreneurial nature of Kazan’s residents — visible in the numerous new and creative cafés, hospitality businesses, and private international partnerships here in the city — provides the fuel for Kazan’s growth engine. Further focus should be paid on nurturing and rewarding not only growth, but also this creativity and enterprise ingenuity, to ensure a sustainable advantage in to the future. This support ought to come through structures that improve ease of doing business, along with more facilitation of general entrepreneurship through the enhancement of the business friendly environment. Fortunately, Kazan has the fertile soil of an entrepreneurial culture to make such policy worthwhile. IT Park and Business Incubator’s inventive atmosphere, spurred by its contemporarily bright-orange walls, towering glass panels, and a massive, modern atrium, seems to insight creativity at first glance. Move past this exterior (and past the security forces guarding the high-tech secrets of tomorrow), and a bustling epicenter of technology entrepreneurship appears. A few floors above ground level, 20 or so small startup ventures occupy a sprawling open office space. Each venture holds a desk area where about 10 employees work openly in a fresh, creative environment. Workers here can meet people working on other projects and share ideas. They share best practices and modern trends. Emerging from this creative soup are some new, exciting ideas for the global tech market, and for Kazan’s development as an entrepreneurial hub for Russian IT commerce. One such website business, SportFort (SportFort.ru), takes the fun of playing team sports off of the field and into the home or office. 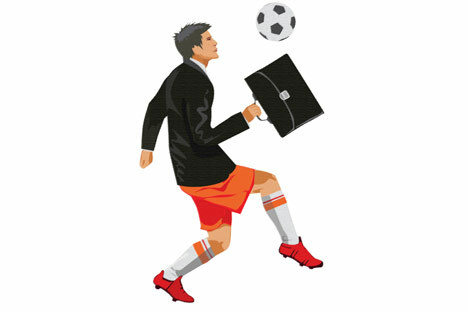 SportFort allows members of amateur sports teams to create their team roster, generate individual statistics and player profiles, and organize match schedules online. It’s a mix of fun and practical use that would appear to have large market potential: imagine combining Facebook with a Fantasy Football league and you have the idea. Certainly this product would fare well in the American market, where amateur sports teams or group competitions, from football to frisbee to golf clubs, are popular with people of all ages. Soccer moms, teens seeking scholarship notice from Universities, corporate softball leagues, and country clubs should all take notice. Another business, 10tracks.ru, also impresses as the first music application platform to allow uploading of one’s private music collection to nearly any music storing device. Imagine a cloud-computing product which allows you to access your favorite tunes via your tablet, phone, or desktop effortlessly, only requiring an internet connection. For those preparing for a long trip where Wi-Fi will be unavailable, the program also caches songs for listening to later on. “This is Cloud technology,” founder Vlad Vernigora stated. “Our program supports many platforms, including Android, which sets us apart from the competition.” 10tracks currently has 7000 users on its live Beta version, and will be accessible to the general consumer beginning in summer of 2012. The startup RealSpeaker (realspeaker.net) truly shines as a user-friendly and marketable product set for international sale (and, incidentally, was my favorite startup of the day). The RealSpeaker system takes what we have come to know as “voice recognition” (when a computer system can understand and transcribe human spoken language) to a whole new level of ease and competency. Using the idea of lip reading (the sort that hearing-impaired persons use to actually “read” the movement of people’s lips for clues on what is being said), and a built in camera to record lip movement, RealSpeaker improves traditional voice recognition accuracy by up to five times. The system, developed by the remarkably young prodigy Victor Osetrov, can be mounted in almost any applicable environment, from cars to offices, with the installation of a very small camera eye. Osetrov stated that the product is currently seeking patent protection in the U.S. and Europe. Kazan IT Park, in addition to the Albuga SEZ and the recent Kazan Invest forum hosted by the Tatarstan Investment Development Agency, show that governmental assistance in business development is aiding the continued growth of the Tatarstan economy. This is, and will continue to be, a progressive step forward. However, credit is also due to Kazan’s citizens, with their entrepreneurial spirit and creative drive, whom are making this success possible by meeting the government funding half way. In the development context, millions of dollars might be poured in to one region or another, with one region succeeding and another region harvesting limited or poor positive returns. Why? The answer is most often the level of creativity and entrepreneurial drive inherent in the culture. It is clear that Kazan’s business culture provides a vibrant base for growth. This is no more evident than in the small, artistic, and creative businesses that have been started — and are seeing success — in Kazan. There is one-year-old I&I Hostel, with its bright, bespoke pop-art interior paintings and management team of young, forward thinking Creatives. Then there is Tsiferblat, a new (and apparently rather secretive) café where time and creative ambiance are valued over tangible goods. And of course, there is Flatstack, a Kazan IT company currently hatching out some of the world’s catchiest websites and platforms — and being run by a small army of creative geniuses, I might add. All of these businesses are shining examples of Kazan’s creative hardwiring. These groups spur future innovation by having the guts and brains to strike out alone, create something new, and succeed. This sort of behavior should be championed and incentivized. Moving forward, it is small businesses such as these where the next Steve Jobs might find his creativity and ambition, thus recreating future growth. Private Public Partnerships are doing well in Kazan to help the magic of this city’s creative entrepreneurial sparks ignite investment funding to produce world-class companies. Given Kazan’s competitive advantage as a place where young, creative entrepreneurs exist, additional support for the business community at large is forecasted to have explosive positive effects. Kazan’s soil is rich with creative undercurrents. If this soil is permitted to sprout, a forest will grow and flourish. The author, who holds an MBA from the University of Notre Dame, is an economic growth specialist focusing on entrepreneurship and regional growth. He is based in Port au Prince, Haiti. First published in The Kazan-Herald, Tatarstan's only English-language newspaper.